A Guide to Amish Furniture in Sarasota To the surprise of some, Amish have had a permanent, albeit small, presence in Florida since the 1920s. The community of Pinecraft welcomes Amish vacationers each winter while maintaining a small year-round Amish population. A number of Amish furniture dealers can be found in the Sarasota area, selling Amish-made beds, dining rooms, cabinets, children’s furniture, living room furniture, and more. Amish furniture outlets are easily accessible for residents of Sarasota and neighboring central Florida communities including St. Petersburg, Bradenton, Palmetto, Venice, Arcadia, Port Charlotte, and others. Amish furniture comes in a plethora of styles including Shaker, Mission, Country, Traditional, Transitional, Modern, and Contemporary. Additionally, some Amish furniture outlets can arrange custom-made pieces. Find a Sarasota-area Amish furniture business using the guide below. More on the Amish in Sarasota. Confirm dealer information given below before traveling long distances. Amish-owned businesses are always closed on Sundays. Furniture retailers owned by non-Amish may be open. Find furniture in other states at the Amish Furniture 50-state directory. Live elsewhere in the Sunshine State? Try our Florida Amish furniture guide. One of the larger Amish furniture dealers, offering over 5000 wood products handcrafted by Amish furniture artisans. Kitchen and Dining furniture includes cupboards, corner hutches, bar stools, benches, microwave stands, jelly cabinets, kitchen islands, pie safes, dining room tables and chairs, pub tables, sideboards, wine cabinets and benches. Office furniture including desks, conference tables, bookcases, computer armoires, credenzas, filing cabinets, podiums, and more. Entertainment and Living room furniture selection ranges from accent tables to curio cabinets, rockers, gliders, entertainment centers, lounge chairs, gun cabinets, sofas, TV stands, magazine racks, stereo cabinets, and more. Bedroom furniture includes bedroom sets, night stands, chests, mirrors, vanities, dressers and more. Also carries children’s furniture (including cribs, step stools, bunk beds, playroom furniture) and outdoor furniture (chaise lounges, benches, porch rockers, swings, picnic tables). Dutchcrafters is an online-only internet retailer in business since 2003, carrying furniture made by Amish from Pennsylvania, Indiana and Ohio. Sarasota-area kitchen cabinet company in business for over four decades. Sells custom-made Amish cabinetry in addition to Dutch Made cabinets. Cabinets come in a variety of traditional and exotic woods, including walnut, cherry, hickory, ash, oak, maple, mahogany, cypress, teak, alder, heart pine, and other exotic woods available on request, pending availability. Finishes available include painted, distressed, stained, glazed, antiqued, and various other custom finishes. In addition to non-Amish and Amish cabinets, Campbell also does other jobs including custom vanities, bathroom cabinets, wet bars, libraries, entertainment units, paneling, and other projects. A truck for Miller’s Dutch Haus Furniture in Sarasota. 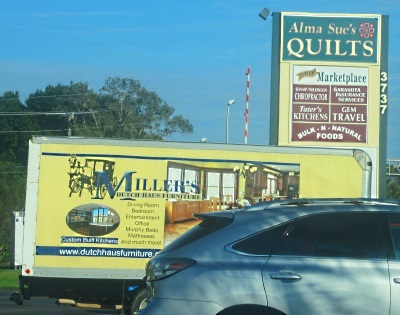 In contrast to internet-only Dutchcrafters, also based in Sarasota, Miller’s Dutch Haus Furniture features a large local showroom situated in the Amish/Mennonite Pinecraft neighborhood (near the Der Dutchman restaurant). Miller’s carries Amish-crafted furniture produced by builders from Holmes County, Ohio. Miller’s Dutch Furniture offers pieces for every room of the home, including dining room, bedroom, living room, and office furniture. Also carries outdoor furniture including Adirondack chairs, swings, gliders, rockers, and lounge chairs. In addition to freestanding furniture pieces Miller’s offers kitchen cabinetry in a variety of styles. Woods available include cherry, oak, brown maple, white maple, walnut, hickory and quatersawn. Furniture styles range from Mission to Shaker, Contemporary, Modern, and Traditional. Closed on Sundays. Technically lying just adjacent to city boundaries, the village of Pinecraft is Florida’s sole Amish settlement and a unique community in Plain society. Sarasota is a winter destination for Amish from northern states such as Ohio, Pennsylvania, Michigan, Illinois and Indiana. Amish have long traveled via regular bus service from home settlements to Sarasota, to stay for one or two week vacations during the wintertime. Amish families make the 18 or more hour bus trip from their homes to relax in a subtropical setting which while quite different from their home environments retains familiar elements in the Amish and Mennonite friends, relatives and acquaintances in the community. 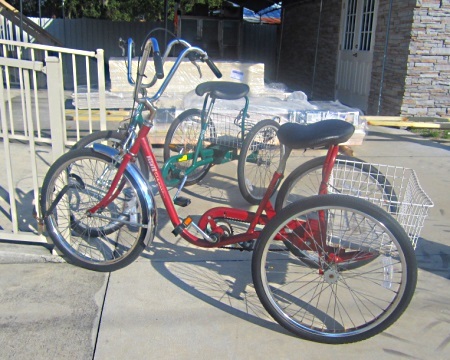 Tricycles typically used by Amish in Sarasota. Amish can be seen riding adult-sized tricycles along Pinecraft’s city streets (no Amish buggies are used in the settlement). A relative handful of Amish live in the Sarasota/Pinecraft community year-round, whose population swells by the hundreds during winter months. Read more on the Sarasota Amish community. About an hour south of Tampa Bay, Sarasota is a popular vacation destination for Amish and non-Amish alike. The wide, white sand beaches of Siesta Key (Siesta Beach was named “America’s Best Beach” in 2011) are popular among Amish visitors to Florida. A number of restaurants serving Amish-style food can be found in the Sarasota area (Yoder’s and Der Dutchman are the two best-known). In addition to these eateries, a few well-established businesses sell Amish-made furniture in Sarasota. While businesses producing Amish furniture are absent from the Sarasota area, dealers in the area sell furniture produced by Amish in Midwestern and other states. Amish furniture dealers in Sarasota may be able to arrange custom-built Amish furniture in addition to lines available in-store. Alternatively, Sarasota and central Florida residents wishing to purchase Amish-made furniture may do so online via dozens of outlets which provide shipping to the Sarasota area, Florida and across North America. If you are in the Sarasota area and wish to visit an Amish settlement where furniture manufacturers can be found you’ll have quite a trip, however. The nearest “traditional” Amish communities with wood craftsmen plying their trade are hundreds of miles away, in states including Tennessee, North Carolina, and Kentucky. See the “Amish State Guide” link in the top menu for more info on Amish communities in other states.